A group of docents from Adkins Arboretum look on as Sylvan explains how to identify mile-a-minute vine. I’m Sylvan Kaufman, a consultant, teacher and writer covering topics from basic botany and ecology to invasive plant control and conservation landscaping techniques. My background is in Ecology. Through undergraduate, graduate and postdoctoral research, I’ve studied plant-animal interactions, plant genetics and gene flow, climate change and plant growth and the effects of invasive plants on native plant communities. I worked as a land manager for six years in meadow, wetland and forest ecosystems and curated a collection of more than 200 native plant species. Working with non-profits, I’ve done everything from lecturing to workshops to managing conferences and plant sales. I teach Ecology and Ecological Restoration as an adjunct for the George Washington University Sustainable Landscapes Program. My father, Wallace Kaufman, and I co-authored the field guide, Invasive Plants. 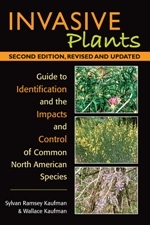 This guide tells the history of invasives, defines their role in natural areas and the economy, describes their role in natural systems, and provides a field guide to over 175 of the most common species in North America. For more information on invasive plants, visit www.invasiveplantguide.com.